Gummi Pugs! Bouncing here and there and everywhere! My recent Cabbage Patch Pugs drawing had me feeling nostalgic for things from my childhood, so here's Gummi Bears, pug-style. Haha! These are so great! 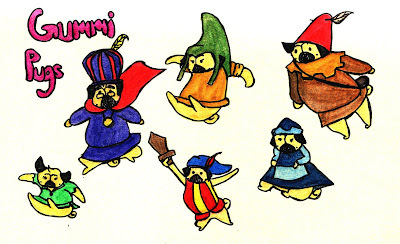 I see them more as pug action figures than gummi pugs. But perhaps they are a combination of those two things! Some particularly fine hats, I must say!